Welcome! What do you think? Would you believe that two days ago, that pendant was a huge silver-y washer sitting in my husband's tool box? I've got the pictures to prove it, and it's EASY too! Here I have randomly dripped Copic Various Inks (ink refills) onto my washer. See how it's beading up a bit? That's because I didn't clean the washer throughly first. I had to use my Copic Colorless Blender to thoroughly clean my washer before I could get the ink to stick well (paper towel with a bit of colorless blender, and some good rubbing). There--that's better! I dabbed at the ink with a scrunched up paper towel. Use whatever you have. . . I thought it needed a bit more variation and character, so I lightly spritzed it with Colorless Blender. Ice Resin, or a similar two-part epoxy resin (takes a LONG time to dry and cure, but is a really tough finish if you want to wait. . . for. . . it. . . And it does NOT disturb the ink--SCORE! After a good 24 hours of drying time, I needed a way to attach a chain to my pendant. I could have asked my husband to drill a tiny hole, but where's the fun it that? I found some really heavy duty silver wire in my craft stash (18 gauge non-tarnish silver Artistic Wire), and used a pair of pliers to twist a couple of loops at the top and then wrap my wire around the washer three times. It's not perfectly symmetrical on there; a thinner wire would have been easier to wrap perfectly. But I'm okay with it. In fact, I think I like it! This was just ONE use of my Copic Various Inks. How about a few others? Coloring non-absorbent surfaces such as glass, metal, resin, plastic, acrylic, etc. Welcome! I have an unusual post to share today in that I'm not sharing a finished project. Today is all about the EMPTY Copic Markers and how I use them. Empty COPic markers come in the Classic Markers, Sketch Markers, and Wide Markers. Most often what I use empty Copic Markers for is to fill blending gaps. Up front I want to tell you that this is NOT a necessity. Is it possible to blend a BG 70 to a BG72 smoothly? Yes, it is; BUT you have to admit that the gap is easier and faster to bridge with that added "faux BG71!" Besides, it's a pretty color, and that's all the reason I need most of the time. ;-) Please Note: Any custom color in the pictures in this post is labeled with brackets around the color name. If you see a color name in brackets, that color is one that I have custom-mixed; it is NOT a regular Copic color. With my BG90's, again, I've filled a blending gap by creating a custom color that approximates what a BG91 would be, if there were a BG91 available. Why? Because it's a fairly big leap from BG90 to BG93, and I simply prefer having an in-between value. This is not a matter of right and wrong; it is merely for convenience. The RV60's are a relative newcomers to the Copic collection. Whereas some color families have many members in the family (thinking of the R20's, for example), the RV60's have only two members--RV63 and RV66. So I wanted a coordinating marker that was a value or two lighter than RV63 in order to have a greater range of value in that lovely family. I tried several markers to find a base tone for RV63, shown on the left. But to pair with my RV63 and RV66, my custom color that I'm calling RV61 is my favorite. And if I need a step lighter than Custom RV61, the V000 works beautifully. Here are my RV60's now, with the empty marker filled and labeled on top. I always save my empty Various Inks containers, then clean them out thoroughly with colorless blender so that I have a good place to store my custom ink colors. On my Custom RV61 above, I made a note of my proportions so that I can repeat them if I ever need to. If I am making a lighter shade, I normally start with half Various inks and half colorless blender. Next I test swatches on paper and then add more ink or more blender depending upon whether I need to make the ink darker or lighter. While I have another two or three custom colors in my collection, you probably understand the concept from what I've already shown you. Every thing that I have shown you stays within an existing color family, but you do NOT have to do that--you can mix colors like a mad chemist and create your favorite blue or blue-green, or maybe your favorite purple if the "perfect purple" isn't available! I would not recommend mixing complimentary colors unless you want to create muddy grays: a rudimentary knowledge of color theory is helpful if you really want to get creative with your color mixing. What other uses might you find for empty Copic markers? OR adding another substance entirely (other than Copic Various Inks) to an empty marker: using food coloring so that you can decorate/write on/ or even airbrush dried royal frosting! adding any thin ink (but not inks that will dry out quickly like paint-based inks). While you may be able to water down a paint-based ink sufficiently to flow out of the nib, it will eventually dry in the marker and stop up the flow. Welcome back! I have a LOT of pictures and information to share tonight. I'm hoping that it gives you confidence to perform basic maintenance on your Copic Markers. It's simple, truly! On THIS POST I showed you how to fill a Copic Sketch marker with Copic Various Ink if you are using the jeweler's scale method. I like the scale method, but it certainly isn't necessary to purchase a scale in order to (1) KNOW when your markers are dry, or (2) REFILL your markers. How do I know when my marker is dry? The marker above is definitely in need of some TLC! If your marker is noisy--sometimes squeaky, and sometimes just louder than usual as you move it across your paper--it may be starting to get dry. If the Super Brush tip is lighter in value than the rest of the Super Brush after you color for a couple of minutes, chances are, you need to re-ink that marker. How much ink do I need to add to fill my Copic Sketch Marker? Well, that depends upon how dry your marker is! The general rule of thumb is to add 1-1/2 to 2cc's of Various Ink to a dry marker. Perhaps this doesn't need to be said, but always CHECK and then DOUBLE-CHECK to be sure that you are using the same color of Various Ink as your marker color. I have picked up the wrong color by accident before. . . twice! How do I get the ink into the marker? There are actually several options. In my first post, I showed you what I think is simplest, and that is dripping ink onto the larger side of the chisel tip. I wanted to show you two other ways as well, because we all have different preferences. If you wish, you can pull out the chisel tip (with either your Copic Nib Tweezer, or even with clean fingers--non-oily and non-lotioned) IF you don't object to stained fingers. Next you merely drip ink into the marker reservoir. If you give it a big squeeze, you will probably have a cascade of ink down your hand. You need to add ink s-l-o-w-l-y enough that it can soak into the reservoir. You should always take BOTH CAPS OFF to re-ink your marker. Otherwise you will create an airlock, and the ink will not want to soak into the reservoir. From the markings on the side of the Various Ink bottle, you can see that I used about 2cc's of ink to fill this very dry marker. How about that transformation? Easy-peasy, right? Way 3: The Copic Booster Needle--yes, that is one BIG needle! For both Sketch and Ciao markers, you need to remove the chisel tip before inserting the needle into the marker reservoir. The Booster Needle, or Refill Booster, comes with a safety sheath; keep it and replace it on the needle after you use and clean the needle. Be wise: if you have a house full of small children, try using the drip methods instead! How do I use the Refill Booster? Insert the Refill Booster into the marker reservoir and give it a gentle squeeze until you have added enough ink (again, generally 1-1/2 to 2cc. for a dry marker). Occasionally when I have a VERY dry Super Brush, I will have ink start to drip out of the bottom of my marker before I have added 1-1/2 to 2cc's. If a marker tip is very dry, you may have a bit of shrinkage. As the tip absorbs ink, it will swell again to fill the entire space. (I first noticed this when I put a new Super Brush into a marker and thought that it was too small; but within a minute or so, it was the perfect size, as ink flowed from the reservoir into the new Super Brush tip.) So if you have added only 1cc of ink to a very dry marker and experience dripage, give it a minute to absorb that ink and swell back up to full-size instead of letting ink drip straight through your marker. Pull the needle out when the marker reservoir is full, and replace the chisel nib. Before you put the Refill Booster Needle away, clean it with either rubbing alcohol or Colorless Blender, and then replace the protective cap. That's it--refilling a marker is NOT difficult! And changing a nib? So easy. . . You've already seen how to remove a nib with the Copic Nib Tweezer. That's half the job done. Instead of putting the same nib back into the marker, slide a new one in. Yes, it's THAT easy! Finally, just a few miscellaneous tips. While it is simple enough to remove a chisel tip even if you don't have a toothed Copic Nib Tweezer, you will find that removing a Super Brush without damaging it is a job best accomplished with the Nib Tweezer. If you tug on that Super Brush with your fingers or a non-toothed tweezer, you can very easily break the outer felt loose from the inner felt, resulting in either the outer felt coming completely off, or in the outer felt becoming very "bendy" and not bouncing back to its shape after being used. Of course, if you are replacing a damaged tip, I suppose it doesn't really matter if you pull it apart in the process--as long as you have a replacement handy! Rule of thumb: any time you need to add ink, add it to the chisel tip rather than the Super Brush. When might you need to take the Super Brush out? Sometimes you may want to insert a different tip, like the Medium Round #4, a stiffer nib than the Super Brush. When you remove the Super Brush, grip the nib firmly with the Copic Nib Tweezer and pull straight out. You want to grip firmly enough to catch both the inner and out felt layers. A sticky nib can usually be remedied by cleaning the dried ink off of the nib. The safest way to accomplish that is to remove the Super Brush nib and to clean it in Copic Colorless Blender. I usually put a few drops of Colorless Blender into a sandwich bag, drop my sticky tip into that bag and squeeze (almost like finger-kneading) the offending tip. Then I pull it out of the bag and squeeze it in a paper towel to get the Colorless Blender out before reinserting it into my marker. Reinsertion requires a good, firm push to get it far enough in. Nine times out of ten, this little process will rescue a misbehaving nib for me. I've said this once before, but a FULL marker is a happy marker! A juicy marker is less likely to sustain damage to a tip than a dry one. So do yourself a favor and keep those markers well-inked! Rarely I have a marker than seems to dry out more quickly than all of the rest of my markers, in spite of being treated the same way. Usually that means that either I did not put the cap on well (listen for that snap!) -OR- I have reversed the caps. Edited to add: A third, but VERY RARE possibility is a cracked cap. I have seen only two of these in ten years. Theoretically all caps in a line (like Sketch markers) are the same size and are totally interchangeable, so that you can put an R24 cap on either end of the R24 marker, and it's absolutely fine that way. Once in a blue moon though, I run across a marker that seems to have a looser cap on one end. Most of the time, if I just switch caps (putting the cap I had on the Super Brush end on the Chisel end, and vice-versa), it helps my drying problem. There--I think I've told you almost everything I know! I hope that you find these tips helpful and not overwhelming. Your Copic Markers are a quality tool that can last a lifetime, given proper care. Again, ask in the comments section if you have questions, and I will try to answer, or try to find an answer if I don't know it. Welcome! I have a different kind of post tonight--no stamps--sorry! It's high school football season again, which means practices and waiting (though Rick does far more of the waiting than I do). Anyway, I try to remember to grab a sketch book and a pencil if I know that I'm going to be sitting in the car for a while these days. Before I forget, four weeks from today (September 23-24) I will be in Las Vegas for Copic Workshops. I hope to meet some of my Copic friends there! Other Copic Workshops that are upcoming include Dallas, Edmonton, Charlotte, Phoenix (Fine Arts), Sacramento, Boston, and Portland, Oregon. For more information, see THIS PAGE. You saw the picture above a few weeks ago when I was working on a rough sketch with my Nobby 3mm pencil; I had mentioned that I liked it for rough sketches because I tended to stay looser when I used a big pencil with fat graphite. If you're a writer, think of it as your rough draft stage--the time when you simply write, without stopping to correct the minutia! The more I looked at my rough sketch, I thought that I'd go with a square format. So here I've cropped the rough sketch down to about 4-1/4" square. I was ready for a clean pencil sketch at this point, so I grabbed my light box and cleaned up lines on a new sheet of paper. I left some of the busy-ness out of the background in this step (and even more out when I started inking). Also, I used a much thinner lead pencil--0.5 mm vs. my previous 3mm pencil. The Finelead 0.5 pencil is generally more in my comfort zone than a thicker lead--it's all about control! I did pull out a black 0.25 Multiliner to draw the square border, mostly because I didn't want to risk having ink run under my ruler! I enjoyed using a dipping pen again, for a change. My Warm Gray Multiliner doesn't need to be jealous though; it's just so simple to throw into my purse and travel with! Now I just need to time to color this one. Is it rude to take markers to a football game? (No, I really won't. I want to watch the game!) Practice, on the other hand. . . Welcome! Before I get started on this LONG post, I just want to mention that I will be in Grand Rapids, Michigan, next weekend, June 3-4 for Copic Workshops. Hope to see some of you there! Yesterday I tackled the subject of how I chose Copic markers when I started collecting them. To be clear, there really isn't a wrong way--just different ways. When I shared color theory basics yesterday, I knew that I would probably cause some eyes to glaze over. Today I thought I'd hit an even simpler idea, as well as offering some of my most used marker combos. We aren't going to worry about additive versus subtractive color today--just the basics. Since the rainbow contains the full visible light spectrum, it would make sense that you could also have a full spectrum of Copic markers by collecting markers in rainbow color families, right? So if you pick your favorite Red, Orange, Yellow, Green, Blue, Indigo (blue-violet in Copic-ese), and Violet families, you should have a pretty good start on your Copic marker collection. Of course, I'd probably sneak in a Yellow-Green family and a Red-Violet family as well. . . but then I love having plenty of color choices! Keep in mind that between photographing color swatches and posting them here, they won't be super color accurate. I did white-balance each swatch, but you really should try a marker or at least compare my swatch to the ones on the official Imagination International Inc. website before choosing, okay? Also, please note that each color swatch is BELOW its description. CLICK text link on right to download. BV00/BV02/BV04/BV08: (If you tend to overblend, you may want to go with BV000 in place of BV00, and BV01 in place of BV02) The BV00's are intense blue-violets with a great range of value. BV11/BV13/BV17: If you prefer a little more violet and a little less blue, you might like the BV10's family better. BV20, BV23, BV25: I sometimes use the BV20's for shadows; they are similar to a cool gray with blue-violet undertones. However, I slightly prefer the V20/V22/V25/V29 family for shadows, especially for shadows on skin tones. V12/V15/V17: The V10's are a little less intense than the V00's, but they blend beautifully. If you need a darker value than the V17, you can always add on the V09, which is a deep, lovely violet. V20/V22/V25/V29: I've mentioned this in the previous section, but I slightly prefer the V20's to the BV20's for shadow tones, especially on skin. V91/V93/V95/V99: The V90's remind me of raisin tones. They are very muted though; so while useful, they probably wouldn't be on my absolute must-have short list if I were limited in the number of Copic colors that I could choose. RV21/RV23/RV25/RV29: I love my RV20's--intense, happy pinks and red-violets! RV10/RV52/RV55/RV66: Yes, I know that this isn't a proper color family. But sometimes you need a marker that is lighter in value than RV52, and sometimes you need a marker darker in value than an RV55. These are absolutely luscious red-violets, cooler and more violet than the RV20's. R30/R32/R35/R37/R39: If you want to work harder at blending, or perhaps use some palette blending, you might be able to get by with just the R30/R35/R39. But it's a challenge. The R30's are slightly cooler in temperature than the R20's, in my opinion. There's nothing wrong with the R20's--I just like my R30's slightly better! RV32/RV34/R56/R59: Yes, I know that I mixed Red-Violets and Reds here, but it works--try it! R81/R83/R85/R89: The R80's are similar to the sequence just above where I mixed some lighter RV's with the R50's. Both are cooler reds, leaning toward mauve/cranberry/victorian red. Neither of the these is really a true red. You need a true red? Then I'd go for the R20's or R30's instead. YR30/YR31/YR21/YR24/YR27: This mixture of yellow-red families ranges from a sheer, barely-there buttercream yellow to a deep yellow ochre--yummy! The YR30 is very light in value, so you might get by with starting your sequence with a YR31. You could also leave off the YR27 if you don't need a deep yellow ochre bordering on raw sienna. However, adding that YR27 gives you a great value range. YR61/YR82/YR65/YR68/E08: No typo there. I mix these up a bit. This is a second possibility of a range of peachy tones to orange and even rust tones. This combination is slightly less intense than the YR00's that are listed on the first line, and you can probably choose one or the other. Y11/Y15/Y18/Y38: Yes, that Y38 looks odd at the end of the Y10's sequence, but it works to complete a range of lemon-to-sunny, intense yellows. YG01/YG03/YG05/YG17: Intense yellow-greens. And, yes, I really do like YG17 better than YG07/YG09 at the end of this sequence. The YG17 is a little yellower, and it's what I usually pick up to finish this sequence. YG21/YG23/YG25/YG17: All things being equal, I'll more often pick up the YG20's family than the YG00's. I still finish the YG20's with that YG17 though. It's a great color! YG93/YG95/YG99: Army green, anyone? This is a really muted yellow-green family. I don't use it on a weekly basis, but when I need it, I'm glad it's there! G00/G02/G05/G07: This is a pale, mint-green to vibrant kelly green family. I love the G00, and G02 for antique glass jars. I don't use the darker value colors quite as much. G40/G43/G46/G29: One of my most used green combos these days. As I mentioned in the Yellow-Greens section above, it is somewhat similar to the YG60's, but more intense and with more contrast, as long as you add that G29 to the end for a truly dark value. Disclaimer: choosing between blue-greens for me is almost like choosing a favorite child--it just shouldn't be done! I'm going to list several favorite sequences and tell what I like about each one. Then YOU can choose what seems more useful to you. BG000/BG02/BG05/BG07: Clear, highly saturated Blue-Greens. Think rainwater to a teal blue, and you'll be close. BG11/BG13/BG15/BG18: This family is quite a bit greener than the BG00's. Think pale aqua to a teal green. BG10/BG45/BG49: No, that BG10 isn't a typo. I needed something light that would work with the lovely BG40's! BG45 and BG49 are perfect blue-greens--not too green, not too blue--kind of like Baby Bear's oatmeal, chair, and bed in The Three Bears. . .
BG70/BG72/BG75/BG78: Muted, cooler, sage-y blue-greens--like a stormy sky all the way to dark ocean depths. . .
BG90/BG93/BG96/BG99: Muted, neutral-leaning and more green than blue. B21/B23/B28: baby-boy-blue all the way to royal blue. These are intense! B60/B63/B66/B69: This blue family leans toward purple to me--very different from the other two blue families that I most often use. B90/B93/B95/B97/B99: Muted, like my husband's work jeans. Any discussion on Earth tones and Grays are going to have to wait until another day. (I colored swatches half the day and still didn't get to the earth tones and grays!) I'm hoping that this will be helpful to those of you who have asked questions about starting your Copic Marker collection. I've normally tried to avoid that question because I knew that it could take forever to explain, and that color truly IS a personal choice anyway. But at least you can see how I've made choices. Again, this is primarily for people who are beginning a Copic collection. If you already have an extensive collection, or if you are feeling more adventurous with color theory, maybe I will have a chance to create a post for you another day. Part 1 of Choosing Copic Markers is HERE. Welcome! Tonight I have an unusual post, addressing a question that I'm asked regularly by blog readers, as well as in almost every Copic Standard Certification: "I think I want to try Copic markers, but where do I begin my collection?" Some people begin a collection by choosing a pre-packaged set of markers, and then adding a second, complementary set later. There is nothing wrong with that method, but I have to tell you that I've never, ever ordered a pre-made set. . . Color is a personal choice for me, like music is. You know how you have an absolute favorite playlist, and your friend inexplicably doesn't share your good taste in music? Well, color can be that way too! Rather than choosing a random variety of colors, try to choose colors in sets of three markers that will work well together--a light value, a mid-tone, and a dark value. Generally, that means that you are safest choosing colors that are in the same blending family, such as R20's--your choice of three of these: R20/21/22/24/27/29. Do you HAVE to stick to color families? No, you certainly don't. In real life, shadows are not as saturated/intense as mid-tones, so choosing your shadow tone from a less saturated color family is often a good idea. However, sticking with color families is certainly always a good and safe choice--especially when you are beginning! Consider what you color most. Are you coloring landscapes? Think in terms of colors that you might see in nature. Are you making kid-birthday-cards at this stage of life? Perhaps bright/saturated/intense colors would be a great starting place for you. Choose colors that you love, and then build your value triad around those. If you adore R37 or R39, then pick a lighter marker or two to go with that one. Is aqua your favorite color? Then don't ignore those Blue-Green families! If you love a color, choose it, and forget about "the rules," because if you love it, you will probably use it. When I started my own Copic collection, I automatically thought in terms of a color wheel. I wanted to be sure that I had primary and secondary colors first, and then I planned to start adding in my favorite tertiary colors after that. Just in case you're interested, here's my oversimplification of [additive] color. . .
Primary colors are the basic colors from which you can mix other colors: Yellow, Blue, Red. Secondary colors occur when two primary colors are mixed: Yellow + Blue = Green, Blue + Red =Violet, and Red + Yellow = Orange. Tertiary colors are a mixture of a primary color and the secondary color that is next to it. So, Yellow (primary) + Green (one of its two secondary neighbors) = Yellow-Green (a tertiary color). Blue (primary) + Violet (secondary) = Blue-Violet (tertiary). Violet (secondary) + Red (primary) = Red-Violet (tertiary). Red (primary) + Orange (secondary) = Red-Orange (tertiary). Orange (secondary) + Yellow (primary) = Yellow-Orange (tertiary). Recently I was scrounging through paper bits that I'd kept over the years, and I found the color scratch sheets above, a reminder of a time when someone had asked me what Copic markers I would consider essential in a limited palette. Ugh! I really wanted a blending set or two from each Copic family, but I was trying to limit myself to around fifty colors. WHAT? No WARM Grays? Whatever was I thinking??? And notice how few skin tones I had in that collection? Clearly I wasn't coloring many people yet, because skin tones weren't of great concern to me then. I'm getting really long-winded here, so I think I'll wind up tonight's post by showing you an old picture (2013-2014) of my first traveling marker set. By that, I mean the seventy-two markers that I wanted to make sure I had with me if I had to travel somewhere to demo Copic markers and couldn't take all 358 of them! By this time, I had added in some warm grays, some muted purples, and more skin tones, as compared to my planning scratch sheets above. But almost all of the colors that I had originally decided I "needed" ended up in the 72-piece set. If I picked a new 72-piece traveling Copic marker set today, I am sure that some of these would change. Tomorrow I want to talk about rainbows and Copics. No unicorns though. . . Thanks for visiting! Part 2 of Choosing Copic Marker Colors is HERE, along with a downloadable chart containing all swatches an explanations. Welcome! Today I wanted to share how I made my patterned paper for yesterday's tulips card. After I finished coloring the Power Poppy Tulips in Hobnail Pitcher image, I started looking for patterned paper that coordinated it; and I just wasn't finding anything in my stash that worked. Rather than go back and tweak marker colors that I was pleased with, I thought I would experiment with making my own Spring-y plaid with a Copic Wide marker and assorted Various Inks. This project started with the sacrifice of a Copic Wide Colorless Blender nib--good thing I have a pack of replacement nibs! I had read Jackson Root's Customize Copic Wide Markers article on the Copic Blog a few weeks ago, and I have often demonstrated adding a second color tip-to-tip to a Copic Wide marker in Standard Certification Classes. Hmmmm, I wonder what would happen if these two ideas played together? These were the colors that I choose to enhance my already-colored tulips image. You can see that nothing prevents the colors from mingling, so this is clearly a time-sensitive experiment--not one that you'd want to drag out over a day or two. I spent probably 40 minutes playing with plaids before I removed the custom nib from my Copic Wide Colorless Blender. If you leave the multi-ink nib in your Colorless Blender, it WILL DEFINITELY make a mess of your Colorless Blender's reservoir. There. Have I warned enough? :-) In case you're wondering, my colorless blender is just fine. But, again, I had it in and out in around forty minutes! EDITED TO ADD: If you are hesitant for fear of ruining a Copic Wide Colorless Blender, keep in mind that you can do the same thing without inserting the trimmed nib back into the barrel of the Colorless Blender. Scroll down tow pictures and see how long that nib is. You can TOTALLY hold it by the end that goes into the barrel and not risk contaminating your Colorless Blender at all. I had no problem with mine, BUT I wanted to point out an alternative way if this makes you nervous! Here were my first few lines--not bad, but you can tell anywhere that I paused in my pulling motion. I've filled two pages with random, casual plaid--no rulers here. I thought I would probably do best to work quickly rather than stressing over plaid perfection. You can see that the plaid pattern gets lighter as I worked. I kept adding a few drops of ink occasionally, but I also I found that if I added a few drops of Colorless Blender up toward what would be the ferrule of a brush area--the part where you are supposed to re-ink a Wide marker--it helped the ink to keep pushing out nicely. My last step after finishing the initial two pages of plaids was to pull out that notched nib and clean it with Colorless Blender Solution. I was surprised at how much of the ink came out, honestly. The reason that I wanted to remove and clean the nib was that I wanted to save my Wide Colorless Blender and keep it--well, colorless. If I'd left the inky nib in the marker, the colors would have turned into a muddly mess. But since I removed and cleaned the notched nib right away, I can save it for different colors on another day, and I can put a new wide nib back into my Wide Colorless Blender and still have a Wide Colorless Blender! You already know that I rarely "leave well enough alone," right? This experiment was no exception! The first thing that I did was to run my Wide Colorless Blender (with the new nib) over my plaid sheet in long, horizontal, slightly overlapping strokes to soften the lines a bit. Next, I decided that I wanted a tinted background rather than having all of the white of the paper showing through; so I lightly airbrushed a layer of Copic RV04 over the top of my plaid, using the Chisel end of a Copic Sketch marker. It looked pretty good at that point, but a little too clean-lined for me. I wanted to age it and grunge it up just a bit. Next I very lightly airbrushed some RV19 using the super brush tip so that I could get a spatter pattern. TIP: When you airbrush with them, the Copic Sketch chisel tip will give you a finer airbrush pattern, and the super brush tip will give you more of a spatter pattern. Both are useful, depending upon the outcome that you want. Finally I cut my square card front and sponged some distress ink on my outer edges. And there you have it--a Spring-y plaid that coordinated with my tulips and looked a casual and vintage! The crazy things some people do after midnight. . .
As a side note, have you explored the Copic Blog? It contains some gems of tutorials and a plethora of ideas for using your Copic markers that you may have never thought of. I'm always inspired when I browse there, even if my spinoff idea has little to do with the original post. Here's one of my all-time favorite posts, a fabulous pet portrait drawn with Copic Wide Markers. Woohoo--I got crafty this weekend! Okay, crafty in a home decor sort of way. :-) When I was at CHA, I loved watching Susan Luke of Second Chances by Susan create beautiful art with Hot Ribbon and her HUGE CQ--creativity quotient. She made a monogram framed wall hanging that I loved, and it was so simple. So I came home feeling totally inspired to pull the Hot Ribbon out and play. First I made a pattern using a couple of fonts that I'd recently purchased, and I put it under tempered glass so that I could do all of the actual work directly on the glass, then peel it up when I was finished and iron it onto my white muslin background. I will attach a pattern here, BUT I have changed a couple of things on it that did not work well for me. That "L" looping through the lowercase "o" looked odd and had to be trimmed off. The "e" touching the ascender of the "k" wasn't one of my better ideas either. It meant that both of those words had to be picked up together. (That was a bit of a pain.) So my new pattern does not have the words intertwined so much. I chose a different font for the word "here" as well. Those little curlicues were awful to make! Here's the pattern: Download Love Spoken Here 2 (.psd file) OR View this photo (.jpg file). What you need are these items: two packages of Black Hot Ribbon (1/8" wide iron-on ribbon), sharp scissors, an iron (the Clover iron is great for this--small, light, and easy to control), a pattern, and a tempered glass surface to initially adhere your ribbon to. Above you can see that I finished the first word. It was the easiest, because it was the largest. To get widths greater than 1/8", you simply layer the ribbon, letting it slightly overlap itself until you build up the width that you want. The curves take the most practice--and the tighter the curve, the more practice it takes. That's where the Clover iron comes in handy though--helping you to get you fingers and the iron into much smaller areas than you could with a regular iron. Another tricky part was that in the second word: I needed strips that were much narrower than 1/8". I knew that if I didn't cut the ribbon in half lengthwise, it wouldn't have the brush script effect. So. . . I started slicing that Black Hot Ribbon in half, or as close to half as I could come! That piece on the lower left is ribbon that I had sliced lengthwise. And here is the final version, minus a few little corrections with my sharpest scissors after I pulled it up off of the glass. This is what it look like when you are pulling it off of the glass surface. (Ever had a good sunburn? :-D) I was amazed at how well the letters retained their curves, since the glue backing had solidified with the curves in place. Here are the letters laid out, with the little scissor corrections made, Out of two packages of black Hot Ribbon, I had about 26 inches left--not enough to made a border. . . I debated ordering more, but I knew that I'd rather just finish it. Here I have ironed the letters on and put together most of my pillow front. To finish, I topstitched the patterned cloth close to the borders, then added a row of Silver Hot Ribbon to frame the muslin piece, along with some black accent buttons (Papertrey Ink Vintage buttons). That's an 18" pillow form--the perfect size for our sofa. The sentiment is to remind the Mama here--oops, that would be me--to keep a kind tongue about me, even when I am standing there loading the dishwasher with the last dish from the sink, and DS plops his two-day-old crusty dishes right into my formerly clean sink. It's almost like teenagers can't see that yawning hole of a dishwasher door. . . That's okay. 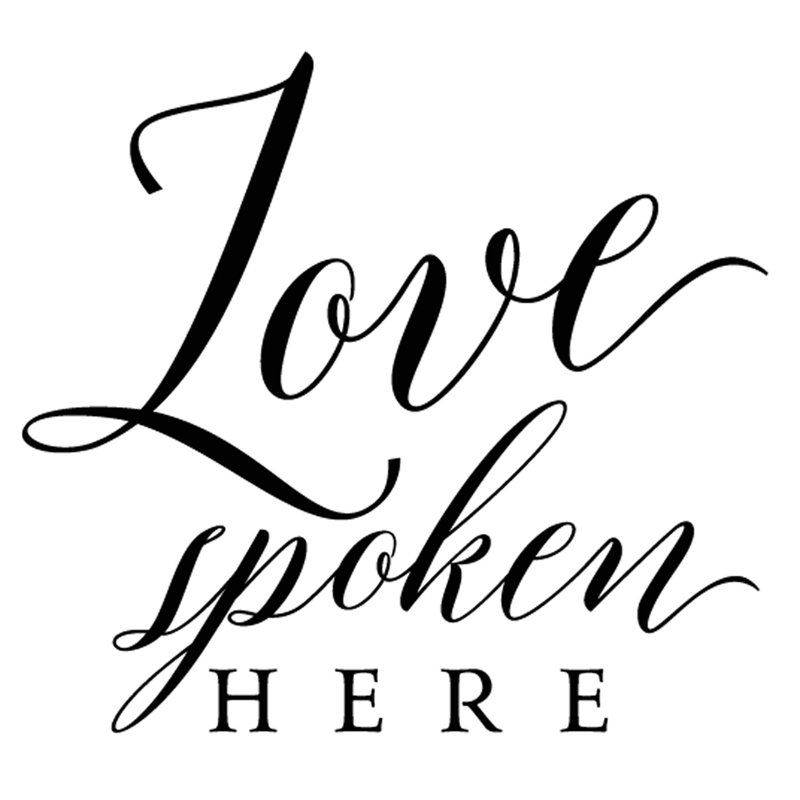 "Love spoken here." He won't remember about the dishes when I am old, but I want him to remember that Mama was kind, you know? I'm headed down to Orlando tomorrow for Copic Certification and Flowers classes. But I'll still be posting a good bit while I'm away since MFT's release week is coming up very soon. I also have several JustRite cards that I made for CHA and haven't posted yet--plenty of blog fodder to come. :-} Thanks for visiting! Welcome! I've been a busy beaver throughout December--stamping and coloring when I have a few minutes and a deadline, and trying to get a handle on some organizational issues as well. I seem to continually acquire more STUFF. And it's great stuff! But it still needs a place to live other than boxes in the floor of my studio. One of the things that I determined to change with the new year was my stamp storage. I've most often used CD cases, and after that the larger clear DVD cases for may clear stamp sets. But it was time to either order another box of DVD cases (not knowing where I would put them anyway), or find a different solution that consumed less space. I remembered bookmarking <<<a fabulous organizational post by Jennifer McGuire>>>. . . That post was an impetus for CHANGE, and I'm so thankful that she generously shares her ideas and sources! Jennifer has a wealth of links on that page as well as videos--I hope that you benefit from them as much as I have! I won't link Jennifer's organizational products; please see HER POST and VIDEOS for those links. But I will show you what I did with my stamps to get them off of the floor. I had some gorgeous KaiserCrafts Kaleidoscope 12 x 12 papers in my stash, and I decided that it was his time to use them up to make my space prettier. I also had a good supply of 12 x 12 chipboard, and decided to make my dividers out of covered chipboard rather than purchasing plastic folders to use as dividers. (Hey, it helped to use the stash, right?) I have several different paper cutters that I love for different purposes. The one that I use most for making cards is my Genesis Trimmer. But when I need to cut chipboard or do repetitive cuts, I pull out a different workhorse, my Carl 12" Heavy Duty Rotary Trimmer. It cuts chipboard like butter, except with multiple passes. I cut my chipboard dividers 5-1/2" wide and 10" high, mostly because the divided plastic container that I purchased from Amazon would hold a 5-1/2" wide divider with just enough clearance to flip though, and 10" high so that my dividers would stick up higher than my tallest storage envelopes and I could see my labels. My first task after cutting the chipboard was to cover it with those pretty papers. I mixed all of the pretty papers and even used the border strips and stickers. . . Yes, there's a first for everything! I used a handy little Clover iron to apply the Hot Ribbon and found it really simple to use. One caution: use the LOW temperature with Hot Ribbon--not high. I accidentally bumped low to high while I was holding the iron, and high was hot enough to melt the ribbon. Low was perfect to make it stick to paper or felt (which I also tried and will show you in a day or two!). I worked on my ironing board so that I would have a heat-resistant surface and not really need to worry about always using the little stand that comes with the Clover iron. (Yes, my ironing board does live in my studio. It doesn't remember its past inglorious days of ironing clothes. . .) If you don't work on a heat-safe surface, make sure you use the Clover iron's stand. I cut each length of Hot Ribbon about 1" longer than the divider width so that I could simply wrap the ribbon around that back and iron it down there as well. I thought that finishing it like that--wrapping it around the back--would make it less likely to get messed up on the ends as I flip though my dividers. I have over 100 sets of clear stamps in this divided container, and I have room for probably about 50 more on the right side, I'd guess. The space that this container takes up is a HUGE improvement over the space that my plastic DVD cases took up. (And remember what an improvement CD and DVD cases were space-wise over the wooden block stamp sets? Oh, my!) I have not purchased all of the different sized plastic envelopes that Jennifer mentions in her post, mostly because I didn't want to pay shipping from multiple places. But for 90% of my stamp sets, the 5-9/16" x 7-7/16" clear envelopes work just fine. On the larger stamp sets, I just can't close the flap; so I usually leave the flap sticking up instead of closing it for all of my stamp sets. My husband came downstairs last night to see what I was doing, and the first thing he said was, "You cleaned up the floor!" I thought he meant that he noticed I'd swept all of my little die-cut bits up. But I'm pretty sure he was referring to the disappearance of some of the boxes that were on my floor. . . My stamps are much happier in a pretty home.